Coleus forskolin, which plays a major role in a variety of important cellular functions, including inhibiting histamine release, relaxing muscles, increasing thyroid function, and increasing fat-burning activity. Coleus forskolin can aid in weight loss due to its ability to breakdown stored fat as well as inhibit the synthesis of adipose tissue, additionally, it increases thyroid hormone production and release thereby increasing metabolism. 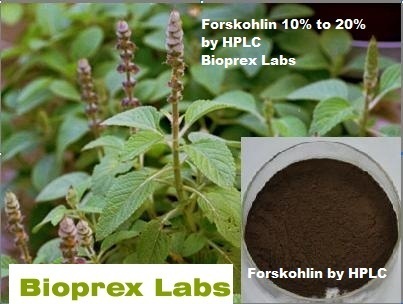 Coleus forskolin has been shown to be safe and effective and has a great amount of potential as a sports supplement. 2007-08 Rs. 50 Lakh - 1 Crore Approx. Established in 1993, Bioprex Labs is a research driven company dedicated to manufacture Nutraceuticals & Standardized Herbal Extracts. Our competence lies in developing extracts that meet stringent requirements of bio-availability, safety and efficacy. Bioprex goes beyond standardization to ensure that the extract is presented pharmacologically most potent with enhanced bioavailability. We have developed herbal extracts and oils customized for the requirements of the nutritional, pharmaceutical and the food industry.